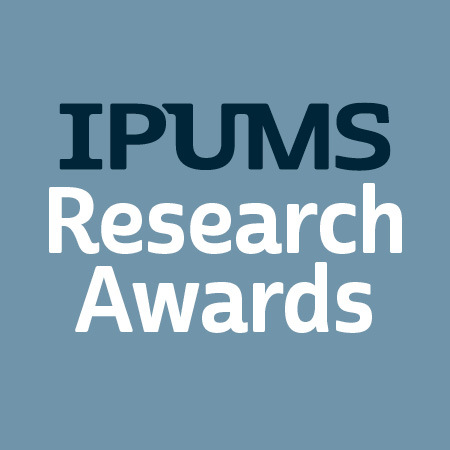 IPUMS is excited to announce the winners of its annual IPUMS Research Awards. These awards honor the best published research and self-nominated graduate student papers from 2018 that used IPUMS data to advance or deepen our understanding of social and demographic processes. IPUMS, developed by and housed at the University of Minnesota, is the world’s largest individual-level population database, providing harmonized data on people in the U.S. and around the world to researchers at no cost. IPUMS USA, providing data from the U.S. decennial censuses, the American Community Survey, and the Current Population Survey from 1850 to the present. IPUMS International, providing harmonized data contributed by more than 100 international statistical office partners; it currently includes information on 500 million people in more than 200 censuses from around the world, from 1960 forward. IPUMS Health Surveys, which makes available the U.S. National Health Interview Survey and the Medical Expenditure Panel Survey. IPUMS Spatial, covering IPUMS NHGIS and IPUMS Terra. NHGIS includes GIS boundary files from 1790 to the present; Terra provides data on population and the environment from 1960 to the present. This award category was new in 2017. IPUMS Global Health: providing harmonized data from the Demographic and Health Surveys and the Performance Monitoring and Accountability surveys, for low and middle income countries from the 1980s to the present. IPUMS Time Use, providing time diary data from the U.S. and around the world from 1965 to the present. Over 2,300 publications based on IPUMS data appeared in journals, magazines, and newspapers worldwide last year. From these publications and from self-nominated graduate student papers, the award committees selected the 2018 honorees. William J. Collins and Gregory T. Niemesh. “Unions and the Great Compression of wage inequality in the US at mid-century: evidence from local labour markets.” The Economic History Review. Doi: 10.1111/ehr.12744. Collins and Niemesh examine a current policy-relevant question from a historical perspective: do places with higher levels of unionization tend to have larger declines in wage inequality? Using IPUMS USA’s 1940 complete-count file and the 1960 5-percent sample, the authors find evidence that higher exposures to unionization in 1940 are correlated with reductions in wage inequality. This paper demonstrates how IPUMS USA’s historical datasets can be used for “new research on the economic history of inequality and labour market institutions. Joe LaBriola and Daniel Schneider. “Worker Power and Class Polarization in Intra-Year Work Hour Volatility.” UC Berkeley. SocArXiv. Precarious workers, or workers who fill a full-time permanent job but without the rights of permanent employees, have increased in the US in recent decades. LaBriola and Schneider examine an important dimension of precarious work: instability in the amount and regularity of work hours. Taking advantage of IPUMS CPS’s new linking keys to exploit the panel aspect of the CPS, the authors find that “low-wage workers experience disproportionately greater work hour volatility. Aude Bernard and Martin Bell. “Educational selectivity of internal migrants: A global assessment.” Demographic Research 39(29): 835-854. Bernard and Bell’s descriptive but ambitious work systematically evaluates the extent to which educational attainment influences internal migration across a global sample of 56 countries. Leveraging IPUMS harmonization of educational attainment into basic categories of primary, secondary, and tertiary, Bernard and Bell find near universal regularity that the likelihood of internal movement increases with educational attainment. Contrary to prior theory, educational selectivity of migrants does not decline as education expands; more highly educated persons are generally more likely to migrate even in countries with higher overall levels of education. Though educational expansion does not explain variation in educational selectivity, substantial regional and national variation does exist, suggesting avenues for further investigation. Peter M. Macharia, Emanuele Giorgi, Pamela N. Thuranira, Noel K. Joseph, Benn Sartorius, Robert W. Snow and Emelda A Okiro. “Sub national variation and inequalities in under-five mortality in Kenya since 1965.” BMC Public Health. Macharia et al. analyze variation in under-five mortality at sub-national levels in Kenya since 1965. They compile birth history information using multiple data sources (including census microdata available from IPUMS International) to understand spatio-temporal variation and inequalities in child morality. Kenya has made enormous progress in child survival between 1965 and 2015, but improvements have been highly heterogeneous across counties within Kenya. They argue for better resource allocation focusing on areas of highest need, which could further boost progress and improve the chances of achieving Sustainable Development Goal 3.2 of Agenda 2030. Justin T. Denney, Jarron M. Saint Onge, and Jeff A. Dennis. “Neighborhood Concentrated Disadvantage and Adult Mortality: Insights for Racial and Ethnic Differences.” Population Research and Policy Review 37(2): 301-321. Making a contribution to social theory and policy debates as well as demography, Denney, Saint Onge, and Davis examine the disparate effects of neighborhood disadvantage on mortality for non-Hispanic whites, non-Hispanic blacks, and U.S. and foreign-born Hispanics. Based on IPUMS NHIS data linked to the national death index and focusing on adults living at or below 300% poverty in different kinds of neighborhoods, the authors find that higher likelihood of death is associated with neighborhood disadvantage for non-Hispanic whites only. Ilya Gutin and Robert A. Hummer. “Putting ‘Work’ Back in Working-Aged Mortality: Employment Status, Occupation, and Cause-Specific Mortality among Contemporary Working-Age U.S. Adults.” University of North Carolina at Chapel Hill. Addressing the recent rise in “deaths of despair” and “precarious jobs,” Gutin and Hummer use the harmonized occupational codes from IPUMS NHIS (OCC1995) linked to the LMF data for working-age adults. After controlling for education, they find elevated mortality risk, varying by cause of death, for unemployed persons and those working in stressful, low-reward, and insecure jobs. Christopher Muller. “Freedom and Convict Leasing in the Postbellum South.” American Journal of Sociology 124(2): 367-405. By linking Georgia convict records to 1880 IPUMS USA microdata, NHGIS county data, and other historical data, Muller shows that “black men were most likely to be imprisoned in the convict lease system [in counties] where they overcame whites’ efforts to preserve their position as dependent agricultural laborers. Ankit Rastogi. “The New Suburb: Multiethnic Racial Residential Integration in the United States.” University of Wisconsin-Madison. SocArXiv. Rastogi uses NHGIS geographically standardized time series to identify cities with persistently high levels of racial integration. These places are typically suburbs in coastal metropolitan areas, and they share high levels of military, university, and public sector employment, larger stocks of new housing, and high levels of metropolitan political fragmentation. Grady, Sue C., et al. “Neonatal mortality in East Africa and West Africa: a geographic analysis of district-level demographic and health survey data.” Geospat Health 21(1): 501. We chose this paper because it demonstrates how IPUMS DHS can be leveraged for analyzing data from multiple countries and to measure SDG goals, and because of the important conclusions regarding causes of neonatal mortality in East and West Africa. The paper also effectively uses integrated geographic data from IPUMS DHS, with informative maps displaying findings across countries and regions. Lovisa Kallmark. “How Does Drought Affect Child Health Outcomes in Zimbabwe.” Swedish University of Agricultural Sciences. This paper effectively joins IPUMS-DHS data on children’s chronic malnutrition with climate data on drought. Kallmark contributes to a broader literature on income shocks and child health outcomes in low-income countries, particularly for countries vulnerable to drought and with widespread child undernutrition. Greg Kaplan and Sam Schulhofer-Wohl. “The Changing (Dis-)utility of Work.” Journal of Economic Perspectives 32(3): 239-258. Kaplan and Schulhofer-Wohl combine ATUS well-being module data with Census and ACS data from 1950 to 2015 to examine change over time in the nonpecuniary costs and benefits of work. They find gender differences with women shifting toward occupations that produce more happiness and meaningfulness and less sadness while men have moved into occupations that are more stressful and associated with less happiness and meaningfulness. Yun Cha. “Converging, not Diverging, Educational Differences in Parents’ Time Use in Developmental Child Care in the U.S., 2003-17.” University of Pennsylvania. Cha uses ATUS data from 2003 to 2017 to examine the persistent education gap in parents’ time with children in developmental care. Cha finds that parents with less than a college degree increased their time in developmental childcare since 2003 resulting in a substantial narrowing of the education gap in parents’ time with children. Congratulations to all our winners, and thank you to everyone who submitted their work. Next year’s award process will open in November 2019.